During the last week in June, more than 100 high school students filled the University of Vermont’s halls and classrooms for the Engineering Institute organized by the Governor’s Institutes of Vermont. 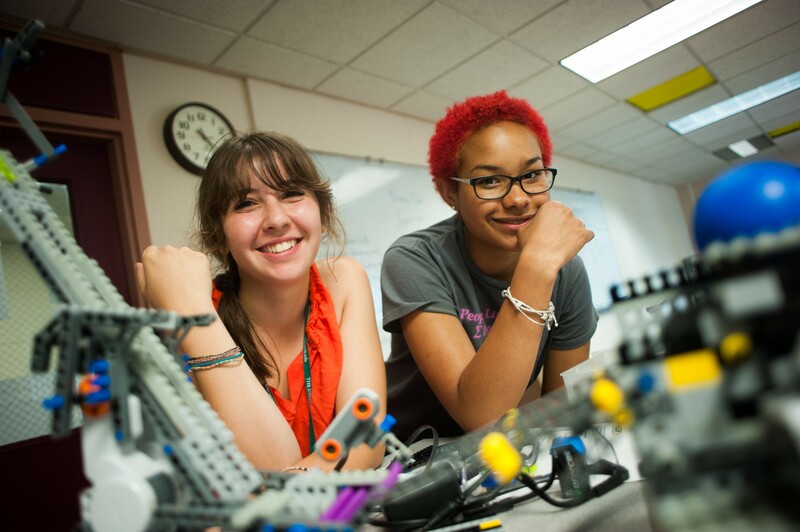 At UVM, they got a taste of college life, while exploring sustainable energy systems, robotics and aerospace engineering. GIV runs 10 summer institutes that provide students the opportunity to explore subjects missing from most high schools. The themed academic camps bring together like-minded kids who speak the language of the arts, technology and science. The engineering institute is currently one of the only programs that accepts out-of-state and international students. Of the 113 students in the Engineering Institute this summer, 92are from Vermont, and others traveled from as far as Washington D.C. and TheAmerican School in London. 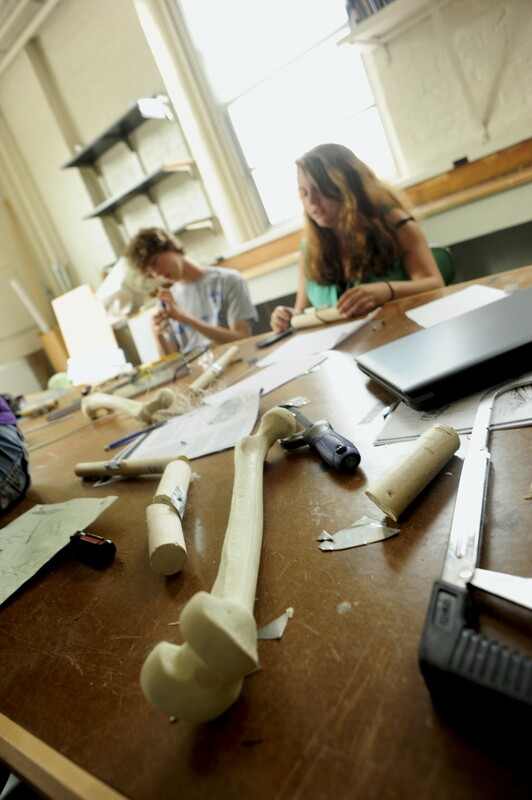 The students spent the week in residence at UVM. This gavethem a sneak-peek at dorm life and provided them with resources they’ve neverhad in their high school classrooms. At the outset, they were sorted into groups and asked to solve a specific world problem as a working engineer. In the photo above, Tom Couture, of Mount Mansfield Union High School, watches his two partners lay down strips of 52 rejected solar panels. 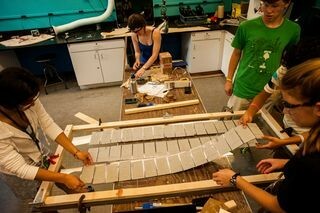 Their goal was to find cost efficient ways for those in third-world countries to build panels for residential buildings. "We would create a booklet with our solar panels showing them how they can use broken windshields or other repurposed materials in their country and would provide them the skills on how to solder the materials together, like we did," said Aubrey Pelletier, 16, from Randolph Union High School. 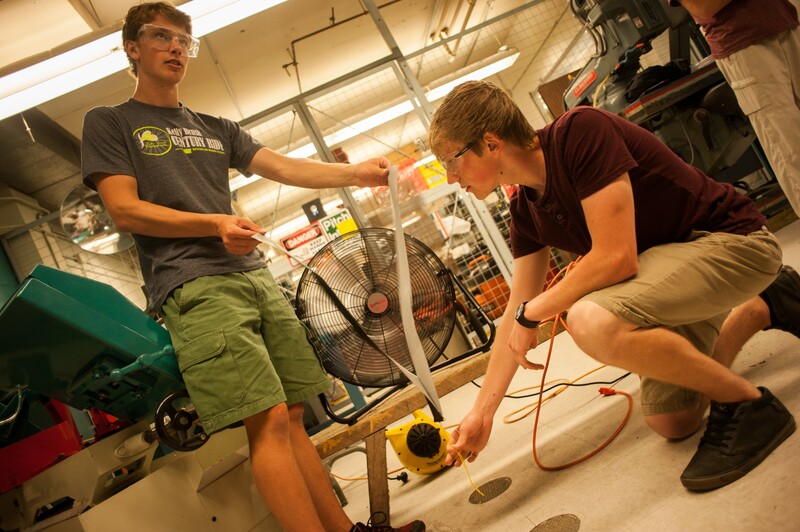 The photo on the left shows Ian Moore, of Green Mountain Valley School, and Ethan Miller, of Colchester High School, testing a wind belt against a high-powered fan. "It uses two ribbons to oscillate in the wind, which pulls a pin up and down that pokes a crystal and creates a small electric current," said Moore, whose hope is to one day design a renewable-energy car. One group experimented with repairing fractured femurs in third-world countries that have few medical supplies. In the photo on the right, Kian Hutt-Bater and Delrita Gilbert design two prototypes — one using rods, the other using brackets. "Engineering and medicine seem to work together. I see myself going to medical school," said Gilbert, who goes to Wahconah High School in Dalton, Mass. About 20 femurs covered their workspace. "So you know," said instructor John Novotny, a lecturer at the School of Mechanical Engineering at UVM, "the thing that they're missing, that my students at the college level have, is the mathematics and the physics to be able to do analysis first. So we obviously skip that part of it, whereas my students would spend a week doing calculations and taking measuresments but here they just jump straight into prototyping and using their hands. "It's exposing them to the fun parts," he added, which seems to be the point of GIV. In the photo on the left, Ryan Parrott of BFA St. Albans, and 10 other students are designing an easy-to-build dome-style refugee camp that can withstand high winds and rain. Their goal was to limit industrial materials and use carpet as extra filler, instead of concrete. "We've had a lot of trouble trying to figure out what we were going to do but now that we have a set plan, we have a final prototype of our triangles. We know it is the best," said Parrott, reflecting on a long week of trial-and-error. Lizzie Michael of Burlington High School said the best part of her week was, "Being able to experiment with different types of science and learning about different strands of engineering, because back at home and at school we don't have nearly as many opportunities to experiment." Michael, along with Alexa Herrera (photo, right) and Taylor Ampatiellos, designed and built a catapulting robot. It's a throwing machine, Ampatiellos explained, for those who physically can't throw a ball and play fetch with their pets. He added that the group next to them is building a ball retriever (for the lazy dogs out there) using a PlayStation 2 controller. See Michael demonstrate the device on WCAX-TV here. Ampatiellos added, excitedly, that there is a robotics club at his high school in Rutland. 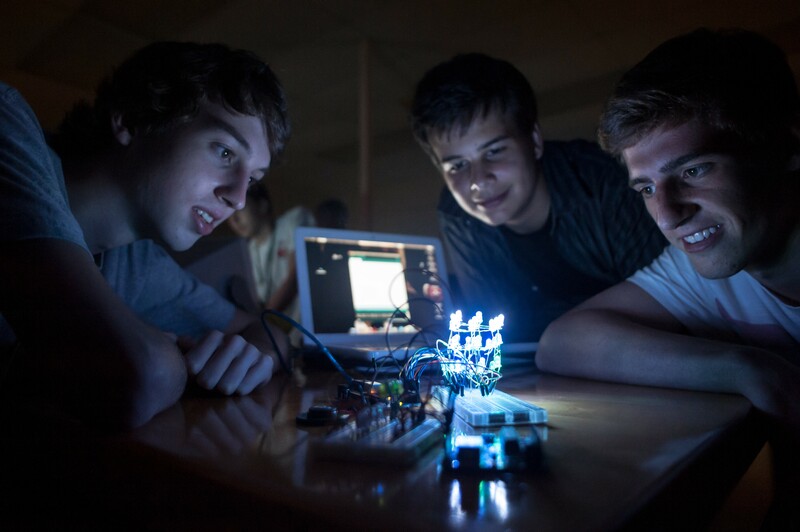 Dylan Prazak, Taylor Tighe and Sam Waite (photo, left) were given a breadboard for circuitry and stacked LED's to it forming a three by three cube. Prazak then wrote 1,000 lines of code to create a spectacular mini-lightshow. "Technology is always developing, every day is new. This is basic circuitry but circuits are in everything, your iPhone, everything and getting a good understanding of this circuitry is very helpful... This is kind of like, the beginner's guide," said Prazak, who attends Mount Anthony Union High School. At the end of the week, GIV participants set up their projects at the University Mall in South Burlington. Shoppers stopped to talk with the students and marvel at their inventions. 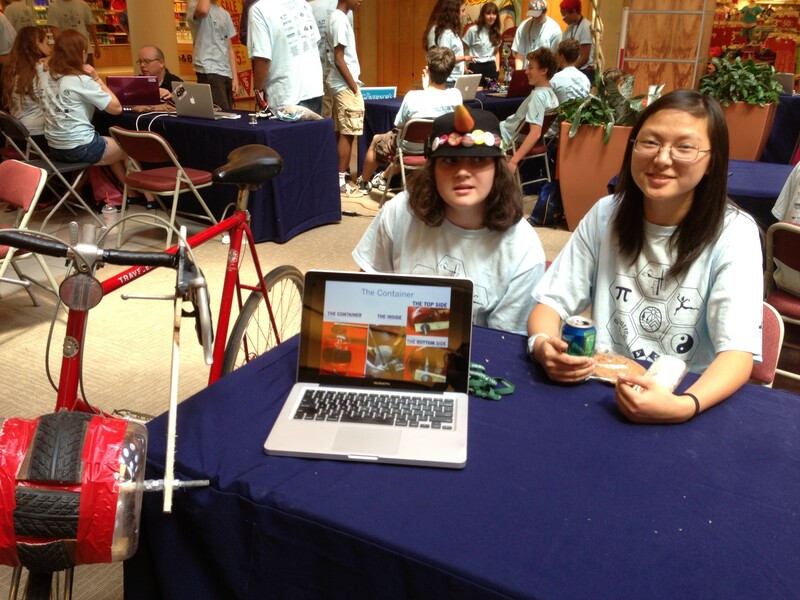 Clementine O'Connor, a sophomore at Cabot High School and Jessica D'Agostino, a junior at the Wheeler School in Providence, Rhode Island, showed off their bike/ice-cream-maker (right). To make ice cream, just load the ingredients and some ice into the tumbler that sits atop the front wheel. Pedal the bike and the tumbler turns, making ice cream. How did they choose that project? "It was a very, very hot day," quipped O'Connor. 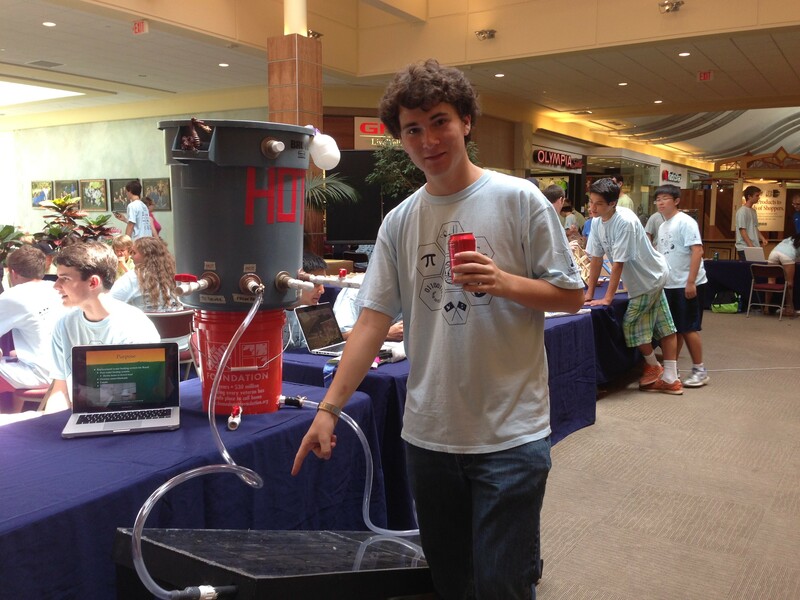 Adam Joselson, of Middlebury Union High School (below), was talking up his solar water heater, which lets users heat water. The water flows from a barrel into a system of pipes that heat up in the sun. "You fill it up in the morning," he explained, "you go to work, you come back all hot and sweaty, and your water will be warm enough." 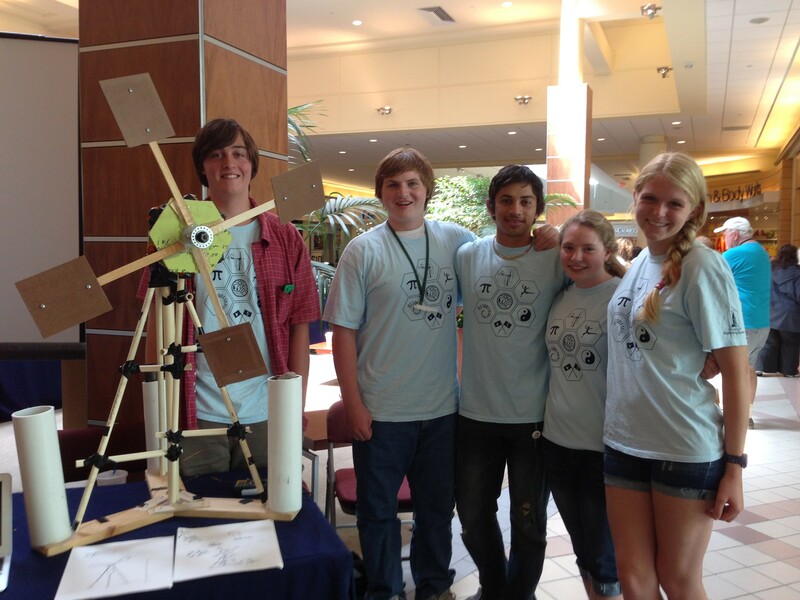 A team of five students from all over Vermont built a wind turbine from recycled materials including a bike axel, magnets, and PVC pipe. It can generate enough energy to run a small fluorescent light bulb, said Sophie McKeever-Parkes, a Middlebury Union High School senior. April Foley, a junior from Mount Anthony High School in Bennington, was also on McKeever-Parkes' team. She said she had a great time at GIV. "It was just, like, an awesome experience," she gushed. McKeever-Parkes added that it was "surprisingly fun." "I know it was going to be fun," she clarified, "but I didn't know it was going to be this much fun." From left to right: Keegan Sheere, senior at Green Mountain Union High School in Chester, Joe Loveland, junior at Mount St. Joseph in Rutland, Yohan Avila, senior at Spaulding High School in Barre City, April Foley, junior at Mount Anthony Union High School in Bennington and Sophie McKeever-Parkes, senior at Middlebury Union High School. Text and images from Engineering on Display by Cathy Resmer.